Fromm Works is a father and daughter team. 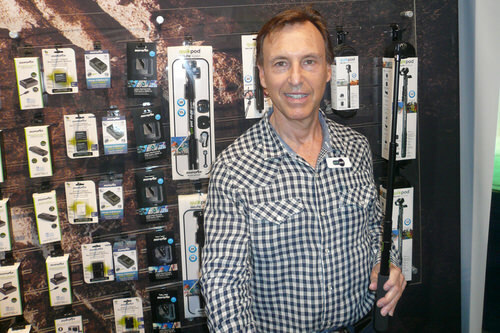 Company Founder Wayne Fromm has invented over 50 commercially successful products including the Quik Pod, the world's first handheld telescopic monopod/tripod he invented in 2004, and "Disney's Beauty and the Beast Magic Talking Mirror invented in 1990". Wayne's daughter Sage Fromm grew up in the inventing industry and now co-creates new products and is part of all aspects of the Quik Pod the original selfie stick. Fromm's business enterprises and associations have been reported in the media including Entrepreneur Magazine, Inventor's Digest, Harvard Business Review, The Wall Street Journal, Investor's Daily News, CNN, Business Week, Toronto Star, Financial Post, Globe and Mail, New York Post and CTV Biography. Fromm has licensed to many global companies including Nestle Foods, Crayola and the Walt Disney Company. Wayne was mentored by the late Jack L. Kamin, co-founder of the multi-billion dollar company Cadillac-Fairview. Wayne Fromm is a successful inventor and entrepreneur with patents in the U.S. and other countries to his credit. Included among his creations are other hits including Disney’s Aladdin Magic Lamp”, “Crayola’s Colour and Show Projector”, “Saban’s Power Ranger Room Defender” and “Nestle’s Nesquik Magic Milkshake Maker”. His company co-marketed the successful toy, “Crazy Bones” a popular collectible that was featured as a McDonald’s Happy Meal. Sage Fromm grew up in the business and has completed an Honors Degree in Psychology on her way to a PhD. Fromm Works Inc. proudly supports various non-profit organizations including the Starlight Children’s Foundation. Sage is charged with social media marketing, customer service, promotions and web development.